Be the first to share your favorite memory, photo or story of Myrene . This memorial page is dedicated for family, friends and future generations to celebrate the life of their loved one. Myrene Lucille Beckman was born at her grandmother’s house in Rochester MI on June 4, 1920 to Gladys (Carmer) and Hubert Beckman. She married Clayton Hardenbergh on December 26, 1941. She died peacefully on Feb. 8, 2019 in hospice care at The Meadows of Owosso, MI. Per her request cremation has taken place and a family burial will take place at a future date. Beki was a steadfast Christian and community volunteer. She was a member of First Presbyterian Church in Royal Oak, active in the Women’s Association and circles, University Presbyterian Church in Rochester Hills, and Eastminster Presbyterian Church in East Lansing. She was past president of the Royal Oak Woman’s Club and a former employee of the Detroit Institute of Art rental gallery. She appreciated orchestral music, theater, fine art, and enjoyed reading, knitting, sewing and playing bridge. Beki is survived by her sons Tom (Linda) Hardenbergh and Bob (Sharon) Hardenbergh, four grandchildren, five great-grandchildren, three nephews and four nieces. To send flowers or a remembrance gift to the family of Myrene Lucille (Beckman) Hardenbergh, please visit our Tribute Store. 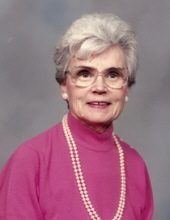 "Email Address" would like to share the life celebration of Myrene Lucille (Beckman) Hardenbergh. Click on the "link" to go to share a favorite memory or leave a condolence message for the family.